Marjitecture. | Architecture + Design + Arts & Crafts + Lifestyle. The craftsy spin on art, design and architecture. ~ Architecture + Design + Arts & Crafts + Lifestyle. ​Another holiday season has come and gone, but hey, I’ve at least managed to get this post up before the 1st Quarter of 2017 is over. Hooray for small victories! 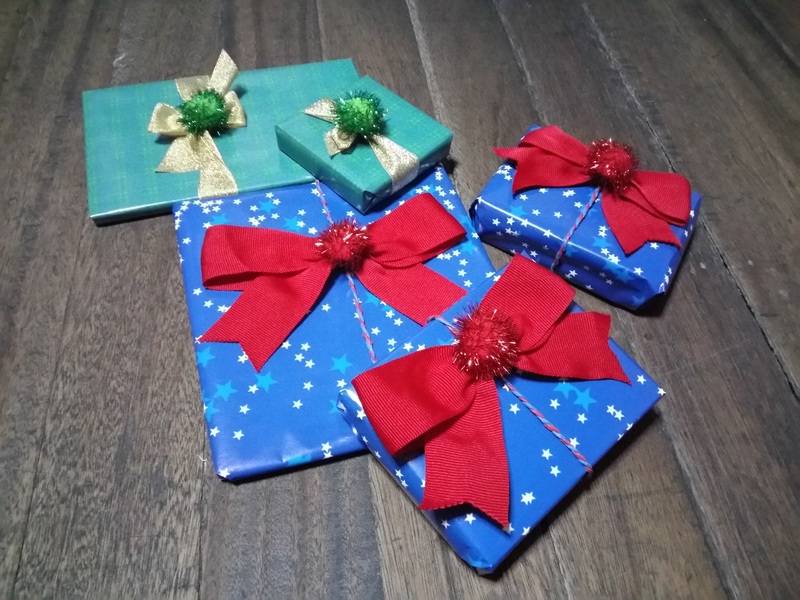 True to the post title, I’ve decided to prioritize quality over quantity, not only when it came to gift-giving, but also in terms of gift-wrapping. Also, for the first time in several years, I’ve put aside my trusty Japanese paper in favor of the “traditional” wrapping papers. 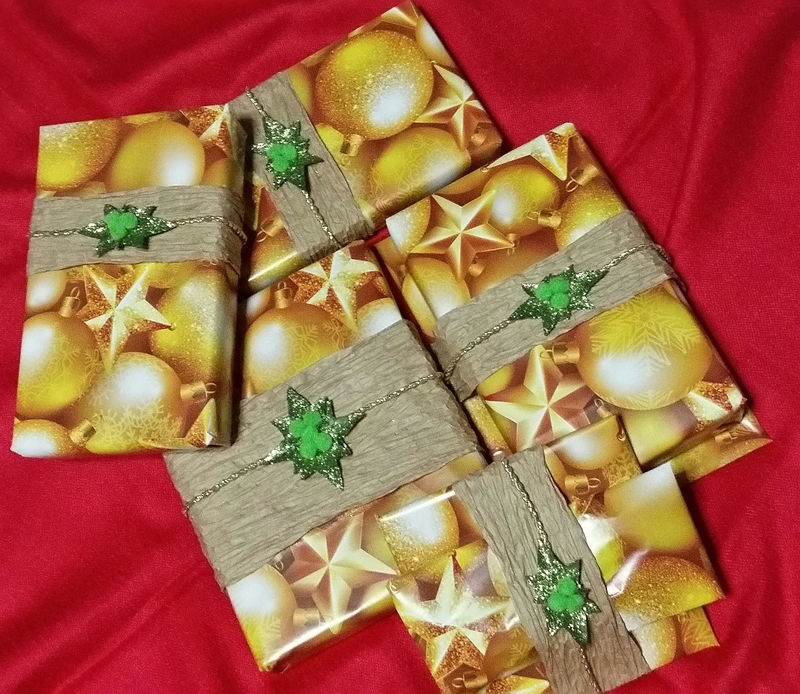 I was pleasantly surprised to find several festive, but uncommon wrapping papers in a small neighborhood shop, and they were so cheap that I just had to get a few rolls! So here’s to more unexpected discoveries and epiphanies this 2017. I’m ready to be (pleasantly) surprised! 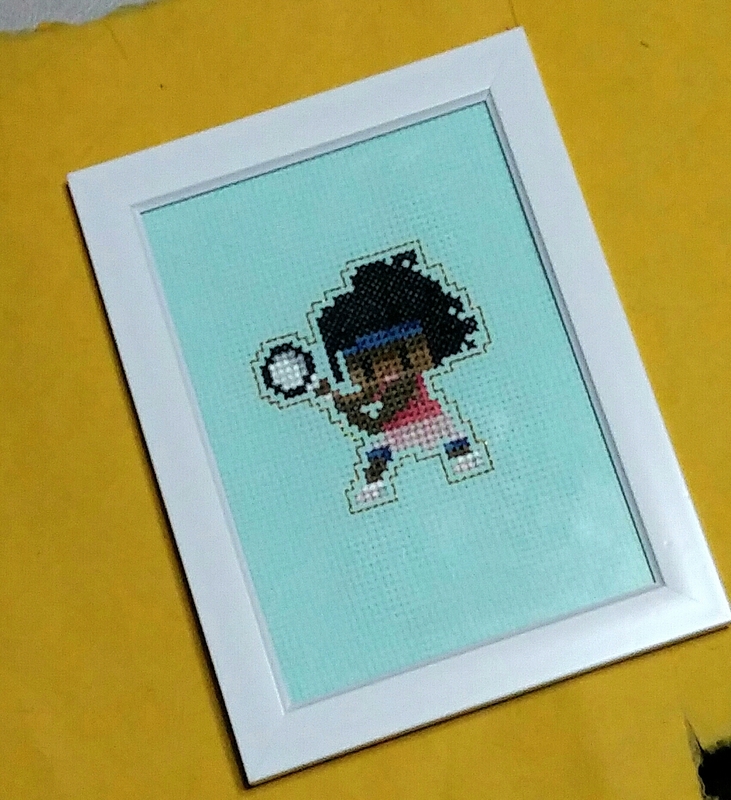 Both me and my friend HM are massive, massive fans of the Legendary Serena Williams, so for her birthday last October, I decided to make her a cross-stitch version of Serena. But wait, how did I come up with this idea? Here’s what my DIY pattern looks like. I only used the thread colors I already had in my stash, btw. This baby is now proudly displayed in my friend’s flat. Here’s hoping 2017 brings Queen Serena more titles and Grand Slams! *Because my friend HM happens to love sports, especially tennis. So I thought, why not embellish her birthday present with mini pom-poms that kind of look like tennis balls? Wait, what did you think this post was about…? ​My friends A and P are August and September Babies, respectively. However, for some quaint reason, our schedules are almost always conflicting during those months so they end up having joint birthday celebrations. In October (Better late than never is a fave cliché in our group). This year wasn’t any different. But hey, joint celebrations should be double the fun! 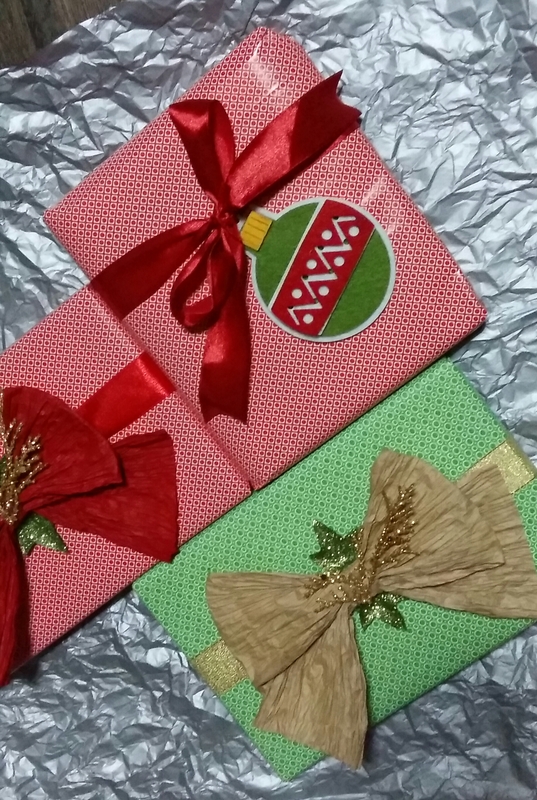 To be honest, I can’t think of a rhyme or reason behind the wrapping designs of their presents. Is it too shallow to say I just went with what pleased my eyes because I wanted them to look pretty? 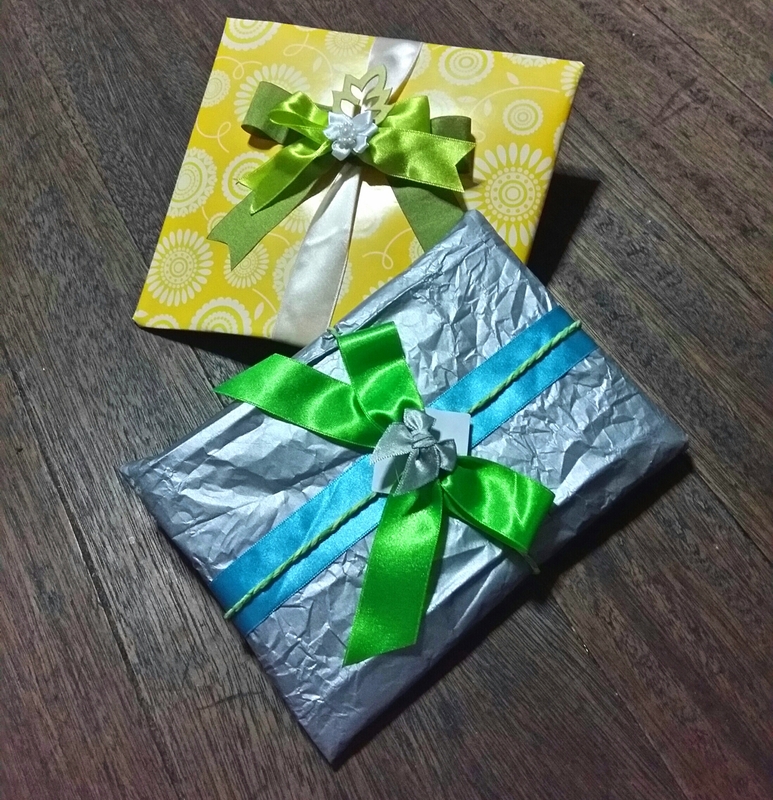 I liked green and white a lot during the night I decided to wrap the gifts, apparently. P’s gift. 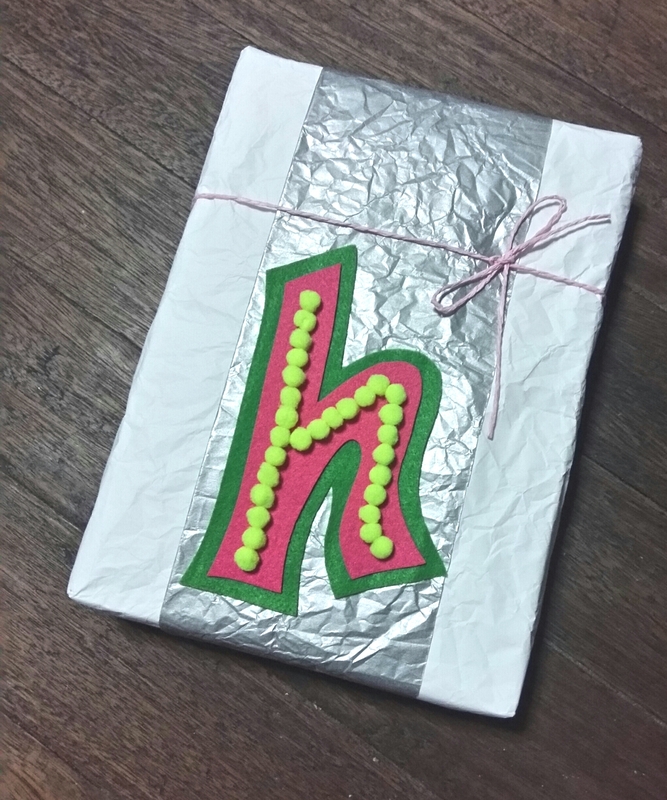 I love the print on the wrapping paper–so mod! 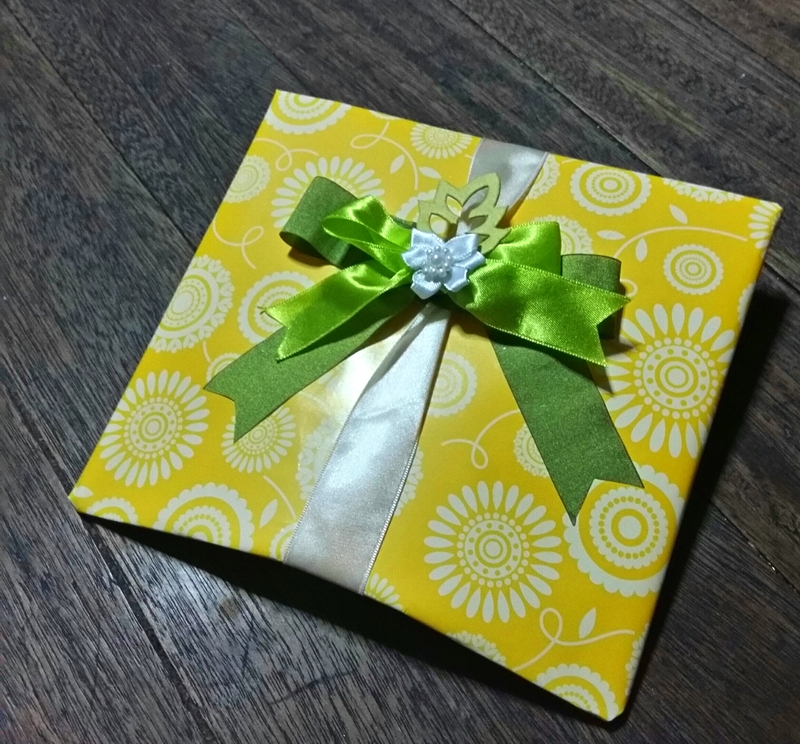 A’s gift. Silver is such a fab backdrop for bright accents. A Good Kind Of Ctrl + X. 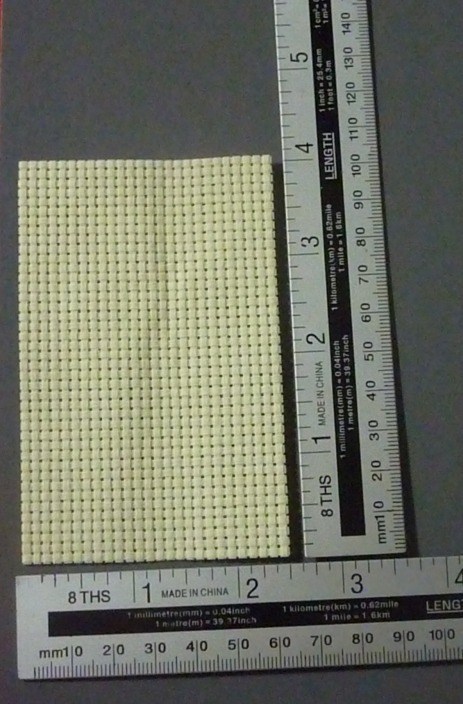 ​Many moons ago, when I was in architecture school, I loved holding and using a cutter (and/or Xacto knife) for scaled model-making. I’m not sure why, but I feel a certain power when wielding extremely sharp things (ha!). Fast forward to the present, and I still love wielding sharp objects, so I finally decided to attend a papercutting workshop by Papel De Pinay, a papercut artist introduced to me by a friend, and whose works I greatly admire (Check out her Instagram page, @papeldepinay). The three-hour workshop was held in a dainty, French cottage-inspired cupcakes and coffee shop and was divided into 3 parts: The introduction to papercutting (history, tools, techniques), papercutting exercises, and the final exam (where the students get to design their own work and the best one gets a prize. Naturally, this was my fave activity). 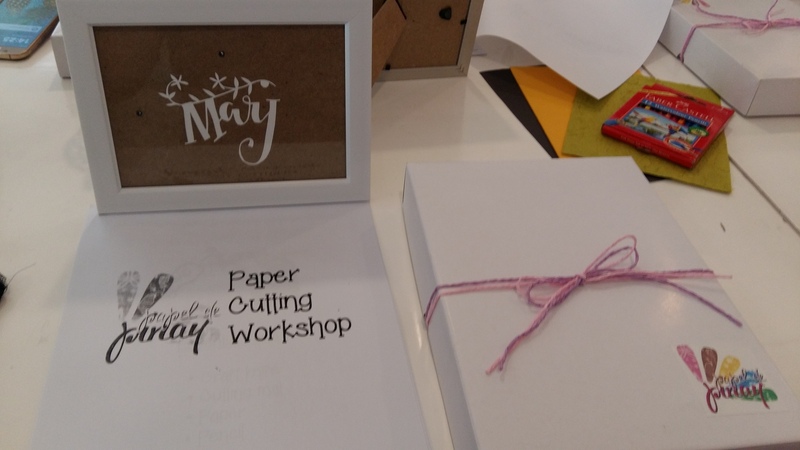 Our workshop kit included: Several sheets of papercutting templates for practice, a frame for our final work, a personalized papercut name piece, several sheets of colored paper and stone paper, carbon paper, mini cutting mat, pen cutter with extra blades, pencil, & a metal ruler. Despite some prior research (thanks, Google), I still learned a lot about the art of papercutting, along with some valuable tips and insider info. By the time we were halfway through the numerous exercises though, I had a newfound respect for all papercut artists as I found that this was not a cakewalk at all! I’m no stranger to long hours of crafting and cutting work but this really takes a lot of patience, and steady hands to boot. 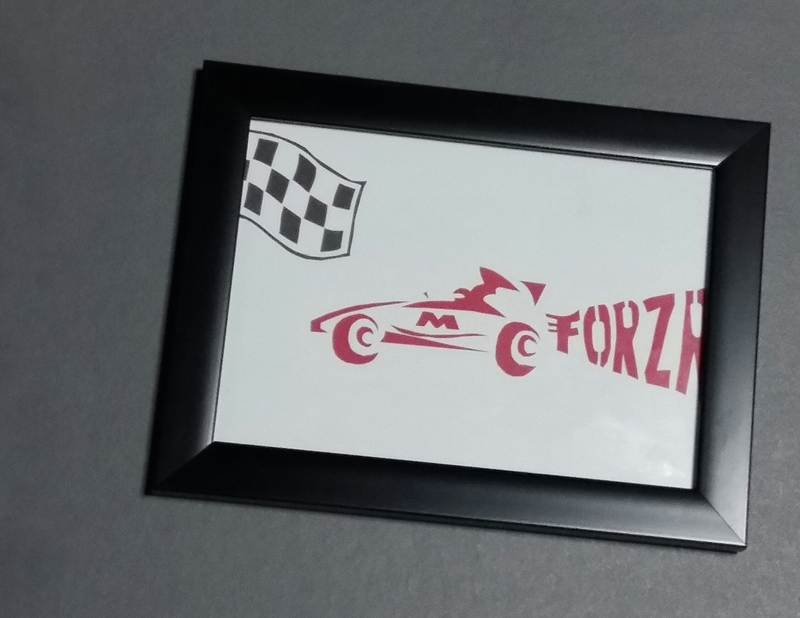 When it came time for us students to design our own work for The Final Exam, at first I was overwhelmed by all the possibilities, but then decided on something I was passionate about: F1 Racing! Here’s my final work. I did the best that I could with only the 1 hour alloted as well as the limited materials available, but lo and behold, my work was judged the best entry among the workshop participants and it won me cupcakes! Hooray! A couple of weeks later, I’ve decided to tweak my work a bit (I was so tempted to clean some lines but decided to just swap the colored paper for a red one and switch frames from white to black. Don’t mess too much with something that’s not broken, right?) and now I’m pretty happy with it overall. Not bad for my first foray into papercutting, eh? I know I don’t really need another crafting preoccupation to exacerbate my insomnia, but papercutting is just too good of an activity to pass up. I’m already thinking of possible designs for new projects and cannot wait to start them, stat! ​I do love me some alliterations. These ones were for the birthday of one my bestest friends, HM. (These were from October of last year. Yikes!) 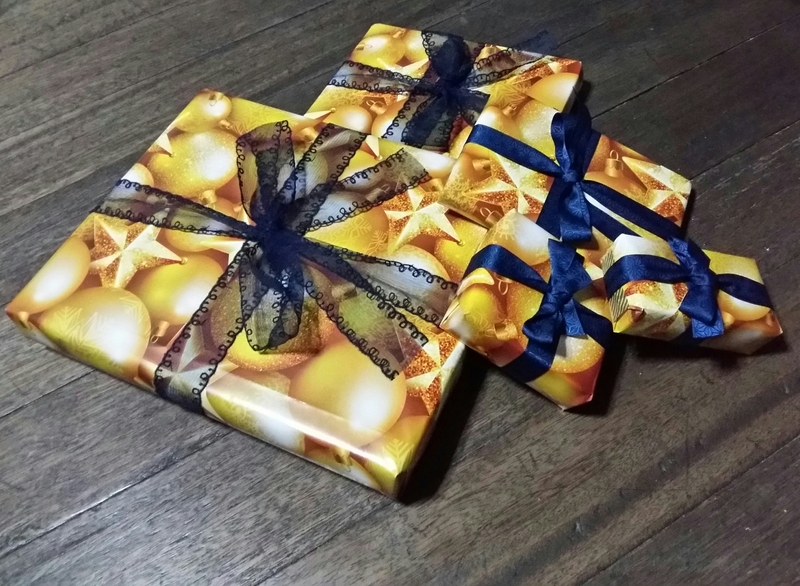 She’s not really a “yellow person”; I just thought I’d change up the color combination of her presents a bit. 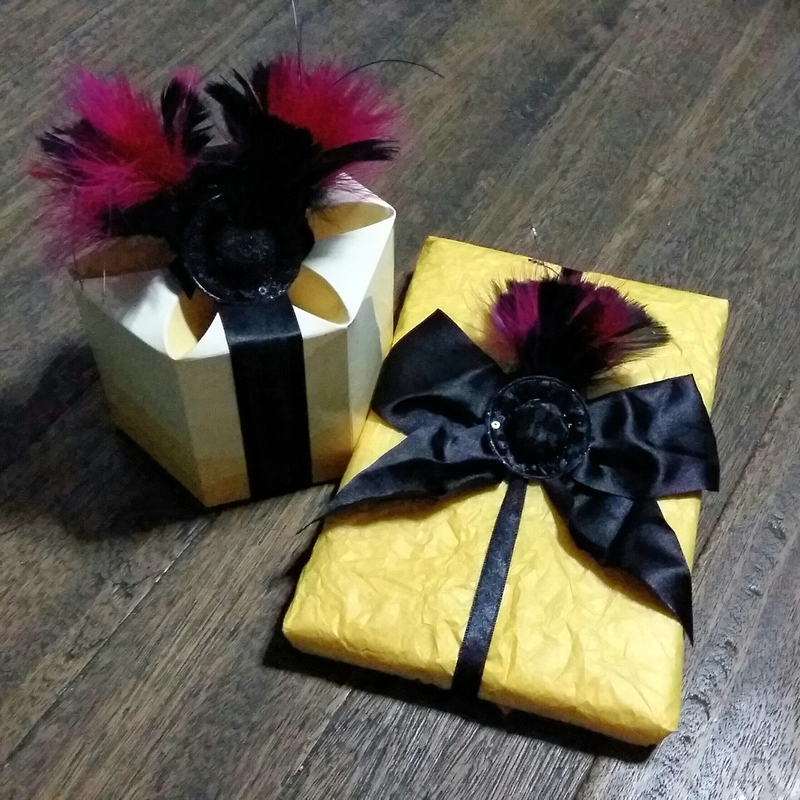 I did still incorporate touches of black and pink in them through the ribbons, feathers and the mini sequined hats. 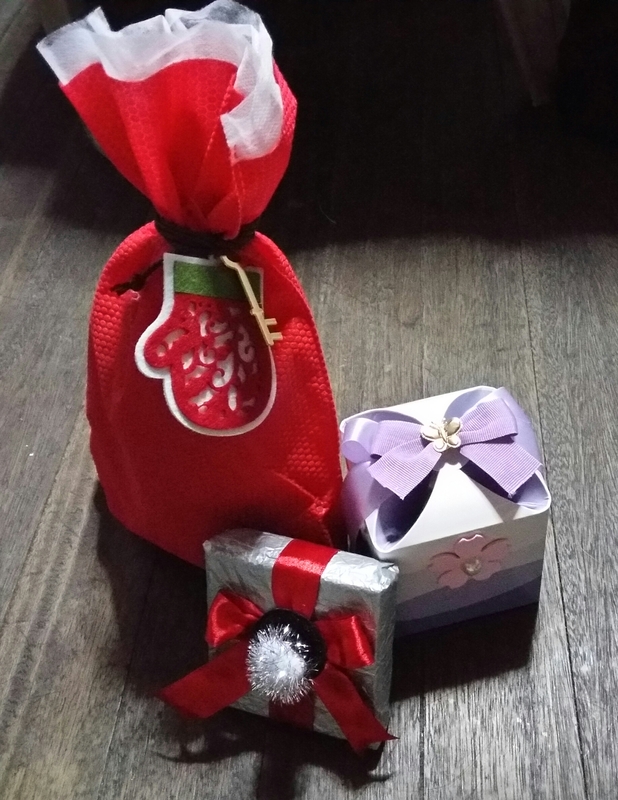 One of my bestest friends, MC, came home last April from Paris with her husband and my goddaughter for their annual holidays, and these were their “Welcome Back!”, “Belated Merry Christmas!” (For the three of them) as well as “Belated Happy Birthday!” (For MC) gifts. 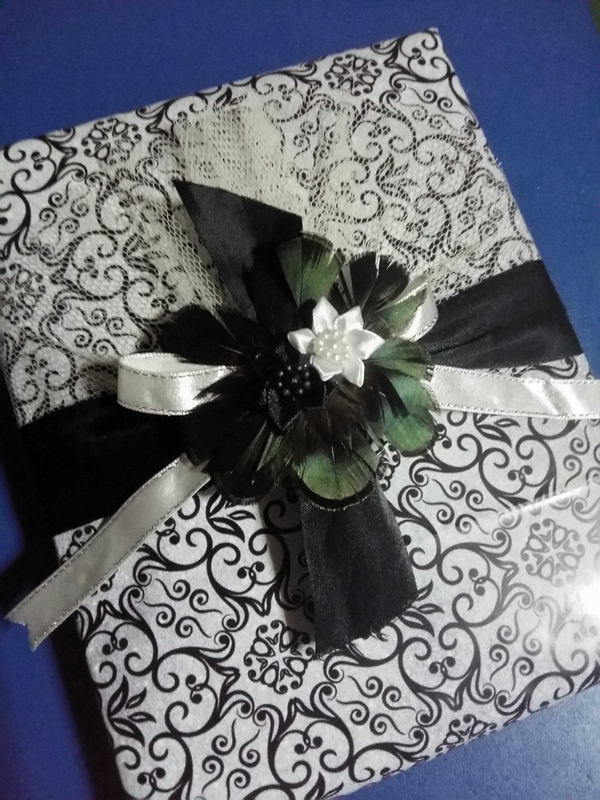 Oh, and I’ve just realized that the small silver box with the red ribbon, black mini sequined hat and fluffy white pompom accents was a belated birthday gift for one of my other friends, also with the initials MC (so let’s call her MC2 from now on). 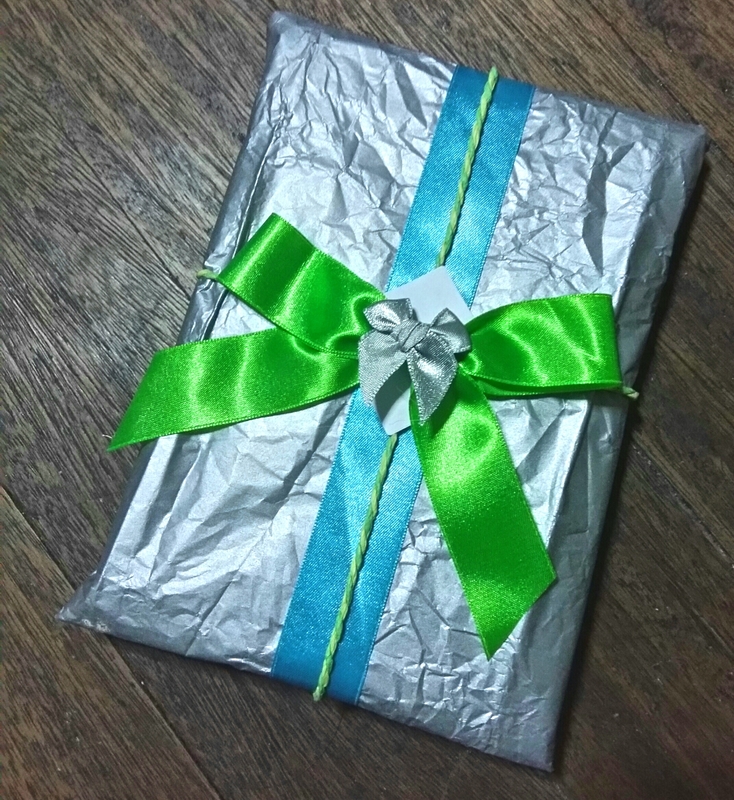 This was for the birthday of my friend N. I found this pretty, damask-esque print wrapping paper randomly at a neighborhood store and thought the style and the colors suited her personality well. It took me quite a while to properly find the combination of materials to accent it with, but the final product turned out quite stylish, if I do say so myself. I shared a pic of this on Twitter and it got plenty of compliments there, too! It’s nearly the end of the year, but I still have several birthdays of friends to go to; hopefully this time around it won’t take me months before I can upload the photos of their gifts! Captain America Saves This Blog*. Right, my sincere apologies for not updating this blog in months (I kind of blame Take That–how can I possibly top that post-concert blog entry, right?). However, the “radio silence” doesn’t mean that I have not been crafting all those months. 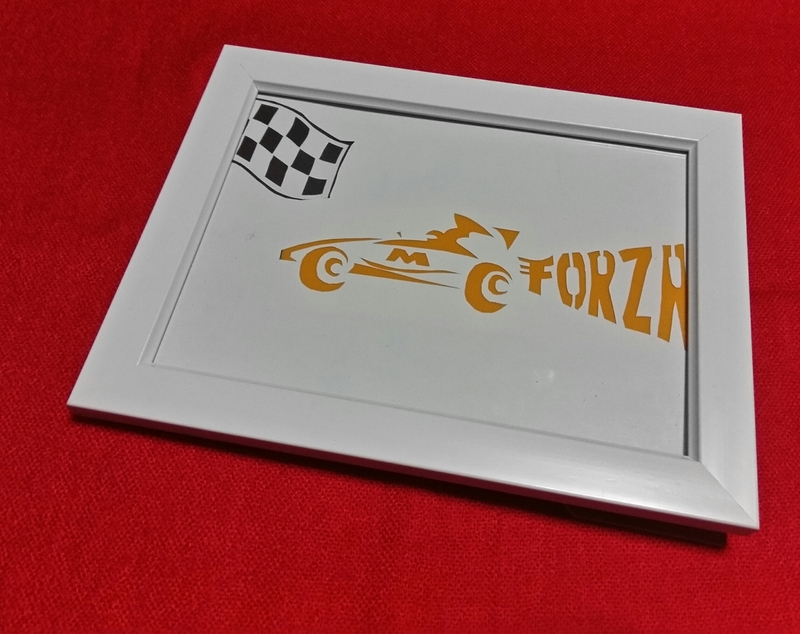 The frame I used is a 2R one, which is around 8.5 x 11 cm. 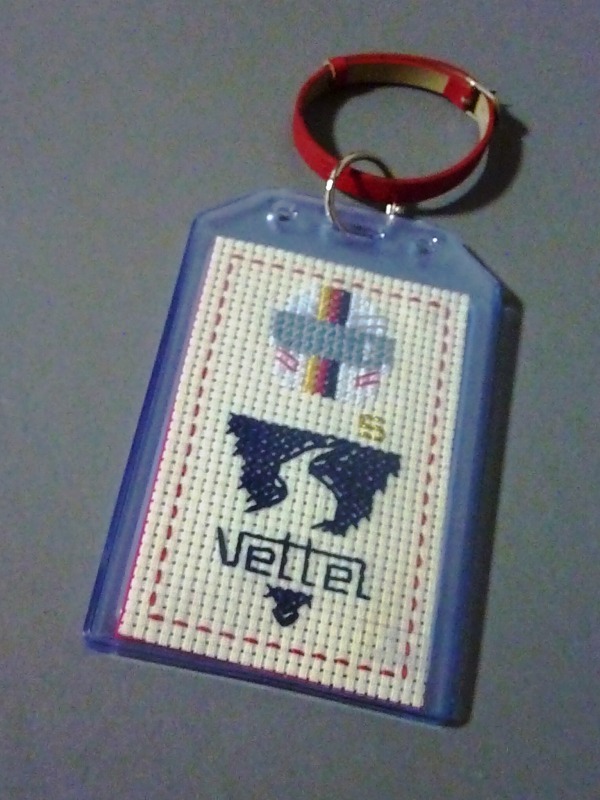 You can use an even smaller frame, stick this into a thick folded board paper as a greeting card cover or make this into a luggage tag or a keychain. After my friend HK saw this on Instagram, she requested one for her boyfriend, who’s also a massive Captain America fan; of course I was happy to oblige! 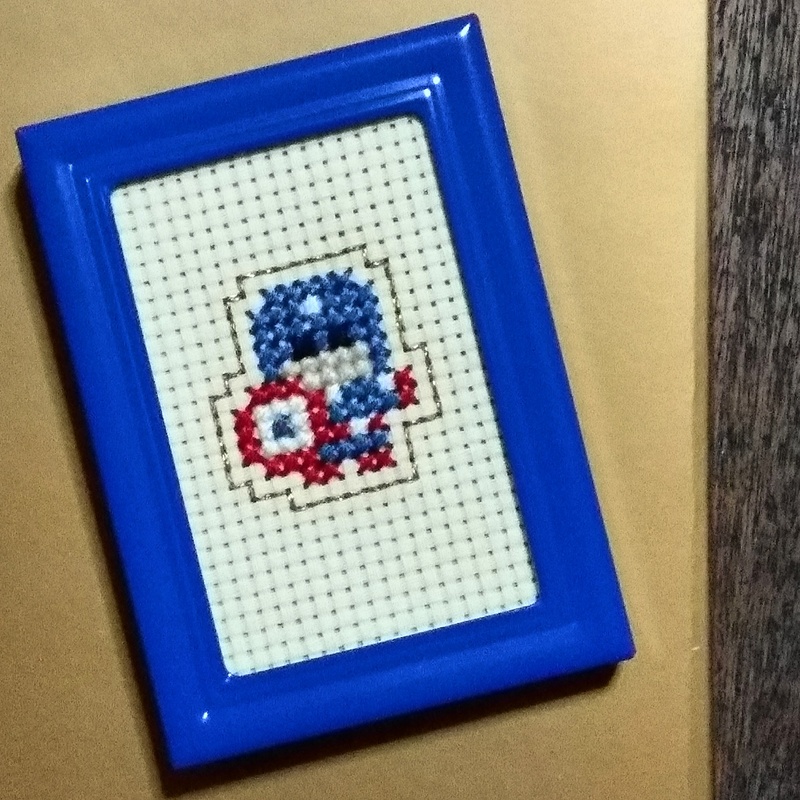 There now exists two very happy (Mini Cross-Stitched) Captain America fans in my circle! Living For These Days: The Take That Trip Diary. Boybands were never a part of my musical interests pre-Take That. In fact, I used to listen to a lot of rock and alternative rock because of my older brother and also to classic rock because of my Dad. But then one day back in 1995, one of my older brothers decided to watch the Brit Awards on TV—much to my dismay, because I wanted to watch something else—and it was there that I witnessed the first-ever performance of Back For Good by this boyband called Take That. The rest, as the cliché goes, is (crazy, wonderful) history. Fast-forward to December 2015 when I found out through Twitter that Take That were to perform at the HSBC Women’s Champions Golf Tournament in Singapore the following March. I remember sitting in bed, nearly dropping my phone in disbelief and feeling like I’ve been pushed into the icy waters of the Antarctic Ocean. I could not pass this up. I would not forgive myself if I missed this. I have to go! After announcing it and freaking out to my best childhood friends on Viber, I bit the bullet and booked the flights, accommodation and concert tickets. Bye, bank account. It’s been nice knowing you. Who cares about being an adult and other life plans? My 2016 will officially begin on March 2016. One of the hardest things I had to endure was The Wait. Not that things didn’t happen during the (almost) three months in between. In fact, there was even a period where I thought I wouldn’t be able to make the trip, due to a sudden illness and hospitalization in the family. But throughout everything, I chose to keep the faith and to train my eyes on the prize: By hook or by crook, I was going to get there. You have to conspire with me, universe! For the meantime, by pure chance and serendipity, I managed to find some Asian Thatters on Twitter who are also coming to see the show, and began to correspond with them. Thankfully, they’re super nice and awesome and patiently answered all of my queries and more, and when I explained that I might be going to the show by myself, graciously offered their company. Further proof that the Thatter Family is the best! Finally, departure day! I didn’t even get to sleep anymore as my flight was due to leave a little before 0600, so I left the house at around 0200 (excited much?) and surprisingly got to the airport within 20 minutes. I tried my hardest to nap during the 3-hr+ flight, but my adrenaline was far too high so I just watched TT videos on my phone all throughout. I landed in Singapore a little after 0900, did my usual routine (exchange money, buy a SIM card for mobile internet), and then went to the computer terminals to check on the BKK-SIN arrivals. I honestly had no idea which flight the Take That lads would be in, and whether or not I even have a hope of catching them in the airport. I messaged my fellow Thatter (let’s call her “A1”) and explained my dilemma: Should I stay in the airport and wait for them or do I go check-in to my hotel first and take a nap? She assured me that it was still early and that I should go take a nap first. I gladly took her advice, went to my hotel in the city center, set up the alarms of 3 mobile phones and dozed off. I wanted to cry when I woke up to the sound of 3 alarms blaring. I was so exhausted and my body was screaming for more than 1 hour of sleep. But, the possibility of meeting TAKE THAT in the flesh subjugated all that. I dragged myself out of bed, checked my messages and saw that my childhood friend J (who’s now living in Singapore) was asking where I was. I asked her to meet me in my hotel and thankfully, she was game to accompany me back to the airport. Well, Take That can be considered as “friends”, yes? Anyway, we first went to the Terminal 2 Arrival area and it was nearly as quiet as a church. We decided to check out Terminal 3 and it was pretty much the same. Since we got there a couple of hours early from the projected arrival times of the Bangkok-Singapore flights, we decided to have a late lunch in T3 and continue our talkathon. As we were finishing up our lunch, I got a Twitter DM from A1 telling me to head over to T1. I got a bit confused because I thought the lads would be taking Singapore Airlines (which lands in T3), but she explained that they were taking Cathay Pacific instead so we should go to T1, asap. We channeled our inner F1 drivers and got to T1 as fast as we could, and there, just outside the Number 21 baggage Carousel, I finally met A1 in person, as well as a number of fellow Take That fans not just from different parts of Singapore but from all over the world as well. We passed the waiting time chatting, exchanging stories and giving one another encouragement (What should we say to the lads? Are they nice in person? Is Gary really that short?). All the while, my insides felt like blocks of ice and my stomach was churning like nobody’s business. The screen finally announced that their flight has landed. This is getting real, y’all. The first to come into view was Howard Donald, with his stature and distinct flat cap. I may have slightly over-yelled “Howaaard!” to him as he passed by, eliciting laughs from my fellow fans. Next came Mark Owen, who paused by the doors and gave us all an enthusiastic wave before heading to claim his bags. A very blurry pic of Markie acknowledging us fans–I was starting to freak out (internally)! At that point, I was standing on top of one of the lower railings and had a clear view of the other passengers. Lo and behold, I finally saw that distinct crop of blonde hair. As if in a sitcom, Gary suddenly turned right and disappeared from view. It took a few more minutes (which felt like several eternities) before Mr. Barlow reappeared, and by that time, the Take That Brigade were fully alert and in high spirits. He briefly waved and gestured towards the baggage carousel, and we were all left counting minutes before the lads would finally make their exit. Gary waiting for his luggage! I took a deep breath and willed my inner calm Yoda to reign above all. The glass doors opened and all of a sudden, I was literally face-to-face with Mark Owen. He moved closer to me for the photo, all the while asking me how I am and if we’ve been waiting there for a long time. I took a couple of pictures of us (because he was still talking during the first one) but then I suddenly spotted Gary Barlow to my left. I hurriedly thanked Mark and said goodbye before he got swallowed up by the rest of the waiting fans and I moved towards Gary. The moment he exited the glass doors, I felt as if everything else in the universe stopped existing but him. Finally! A photo with GB! I fished around in my bag and produced a small round canvas and my Sharpie, and made my way to Gary again (who was still busy signing stuff for fans and chatting with them). I’m not sure how it happened, but suddenly, Gary was next to me, his left arm rubbing against my right arm as he leaned on me to sign the canvas. I can’t put my truthful answer in here, there may be kids reading. Insert internal groan from me here. Smooth, Marj. Not. GB talking to fans and holding my mini red jeepney! Aly and Irene are two Philippine Thatters I met through Twitter, by the way. And they’re so nice and awesome I thought I’d surprise them by having G say hello. Unfortunately, only the first part got saved on my phone, but it was really lovely and kind of Gary to say hello to them! If only I could make Gary stay longer and get him to keep talking in that melodious voice of him. Finally, Gary started towards the airport exit, still surrounded by fans of course. “Keep it moving, keep it moving!” He joked. My friend J and I followed, mainly just so we can just stare at his perfection. Fortunately, we managed to catch up with Mark Owen just near the exit doors, and I hurriedly snatched my canvas and Sharpie again to have it signed. He waved goodbye and exited through the glass doors. Hotdamn, that signature Mark Owen smile, though. I’m surprised I didn’t melt right then and there. But if you think this is over, it’s NOT. Through the glass doors, I spotted Howard and his flatcap walking outside, surrounded by fans. I’ve gotten 2 out of 3 signatures so far so why not go for 100%? I yelled at my friend that I was going to go after Howard, and went off to chase him outside. And just like that, the TT lads were gone. My friend and I went back inside the airport and I proceeded to flail and squeal and do all sorts of fangirl gestures to her. We regrouped with the other Thatters and proceeded to flail and squeal and fangirl/fanboy all over again. After taking group photos, we bade each other goodbye and “see you tomorrows” and went our separate ways. I had to tell my friend to literally drag me by the arm if need be as we headed back to the city, as my brain honestly could not function properly at that moment. We went to the 313@Somerset mall to claim my concert ticket, and funnily enough, the girl who assisted us was a massive Take That fan as well so it was a real hoot telling her how we got to meet the band just moments earlier (there were loads of flailing and OMGs were exchanged). We had dinner, shopped a little, relived the hilarious moments earlier, and then parted ways. I met up for coffee with a local friend who I met through Twitter several years ago via our common love for Formula 1 but she sent me back to the hotel early so I can get some sleep. But to be honest, how the heck do I sleep after the day I just had? I was exhausted, but it was the best kind of exhaustion. I woke up groaning, and for a few moments I had no idea where I was. The only thing I could think of was how annoyed I am at myself for setting the alarm on a weekend and that I want to sleep some more. But then my mind recovered and remembered that I met the band yesterday and today’s the Take That concert. That made me practically leap out of bed. Strangely enough, I had practically zero appetite that day. I only ate a piece of bread, an energy bar and drank some orange juice for my late breakfast/early lunch, sent messages to fellow Thatters A1 and D that I was on my way to the venue, and then set off to officially start my day. While waiting in the Harbourfront Bus Interchange, it suddenly started to rain. Not a light drizzle but the sort of downpour that made my glasses fog up and become opaque even within the safety of the bus shelter. Oh man. Thankfully it stopped after 10 minutes or so, and apparently, it was still blazing hot and sunny over in Sentosa. Throughout the whole bus ride, there was this strange calm that enveloped me. I cannot believe that my 21-year wait to see Take That perform live would finally be broken later that day, but I suppose meeting the lads the day before greatly helped in lessening my anxiety and sky-high expectations. As I was making my way to the queue, I chanced upon A2, a Filipino Thatter living in Singapore who I met at the airport the day before. We queued together (Numbers 21 and 22!) and passed the time chatting about Take That and our other musical interests. It felt great to connect with someone with the same interests so easily, especially since we can discuss using our native language so we didn’t have to worry about anyone understanding (and possibly judging) our crazy and weird conversations (ha!). Nearly 3 hours into queuing, the rain that befell on us in the Harbourfront Bus Exchange finally reached Sentosa. Everyone donned their plastic ponchos, opened their umbrellas and bemoaned the sudden downpour, but I was confident that the rain would stop before the show began. And even if it did rain during the show—who cares? For one night, we would all be waterproof for Take That. Finally, the wait was over. We Super Fanzone ticket holders were carefully escorted into our area, and much to our delight, we got right to the front of the stage! We took photos, chatted some more and then, as if a switched has been flipped, nighttime fell and before we knew it, we were hearing the glorious sound of the Shine intro. “OHMYGODTHISISIT!! !” –My main thought on loop, in case you want to know. *Gary. Barlow’s. Voice. Live. I can honestly write a whole blog post about it (maybe next time), but the short of the long is that his voice sounds way better live and that it was worth the 21-year wait to hear it. Perhaps even the angels singing in heaven may not be able to compare to it. I am not even kidding. *Mark Owen attempting to speak Chinese/Singaporean was too adorable for words! I lost track of how many times he said “Xie xie! !” throughout the night. *Patience live was too lovely for words. Gary’s falsetto is like warm honey running down your throat. You know what I mean. *I finally got to see the famous/infamous Pray dance routine live (albeit in semi-slow motion, I blame the heat and humidity)! Howard and Mark can still put young boyband members to shame with their moves, and those who say that Gary cannot dance can stick it where the sun does not shine—that man can still get down on his knees like he’s 19! *Let’s talk about THAT stagecrasher during Could It Be Magic, then: Everyone was busy enjoying watching the lads sing and dance when suddenly, this woman ran up to the stage, stumbled in the steps and was in the process of being taken away by security when she somehow got away and practically crawled on to the stage! Sir Gary of the Barlows came to her rescue, helped her up, gave her a hug and then made her leave the stage with as much grace as possible. I know we are all TT-mad but honestly, for a split second I got scared for the lads when I saw her rushing to the stage. When I reviewed my video of the incident, I very audibly screamed “Oh My God!” the moment that happened! And yes, after being escorted off the stage by security, that woman attempted another run to the stage a few minutes after. Geez. Quit while you’re ahead! *Mark Owen and Gary Barlow getting to sing their own songs 4 Minute Warning and Let Me Go were pleasant additions to the setlist. I kind of wish Howard got to showcase his DJ-ing skills as well! *The Piano Medley included How Deep Is Your Love which was such a welcome addition. The lads rarely sing this live so it was a treat for us Asian fans. *I seriously needed a MOMENT when Back For Good started playing. My friends were all teasing me that I will cry when I finally hear that song live but honestly when the moment arrived, I felt everything and nothing at the same time. Time stopped. It was too beautiful and complex to be explained. When I’m sad or stressed or upset, I just remember this moment and I instantly feel better. *I don’t care whether you are the Pope or the Prime Minister or a pauper—when you hear Lulu’s part in Relight My Fire, you have to sing along! Don’t we all want someone to look at us the way Mark Owen looks at Gary Barlow?! *By the time Rule The World started, I knew the night was coming to a close, so I chose to savor every single line and thank the heavens that all the stars indeed came out for us that night! *Never Forget Live was nothing short of glorious. To be able to finally lift my arms up in the air with thousands of Thatters was an unforgettable, goosebumps-worthy experience. Overall, I’m extremely happy that the crowd sang along loud and proud and was very participative. The Power of Thatters! Moments after the lads exited the stage, we were all still in a wonderful daze. Did that just happen? Did that just REALLY happen? Yes it did, and it was short and sweet but still absolutely perfect in every way. Me during and after the show. When I finally got back to my hotel, it was only then when I realized just how hungry I was. I have not consumed anything other than water for the last 12 hours or so. But who needs food when you have Take That to fuel you? Take That were worth the wait. Take That are worth it. Full stop. So what were my (other) takeaways from this trip? Things will all fall into place when the time is right and that the universe will conspire with you when it comes to the things you are truly passionate about. You need to take a leap of faith and break out of your comfort zone in order to experience truly extraordinary moments (and to meet truly extraordinary people). One month and 7 days later, I finally got my TTIII autographs and ticket framed! 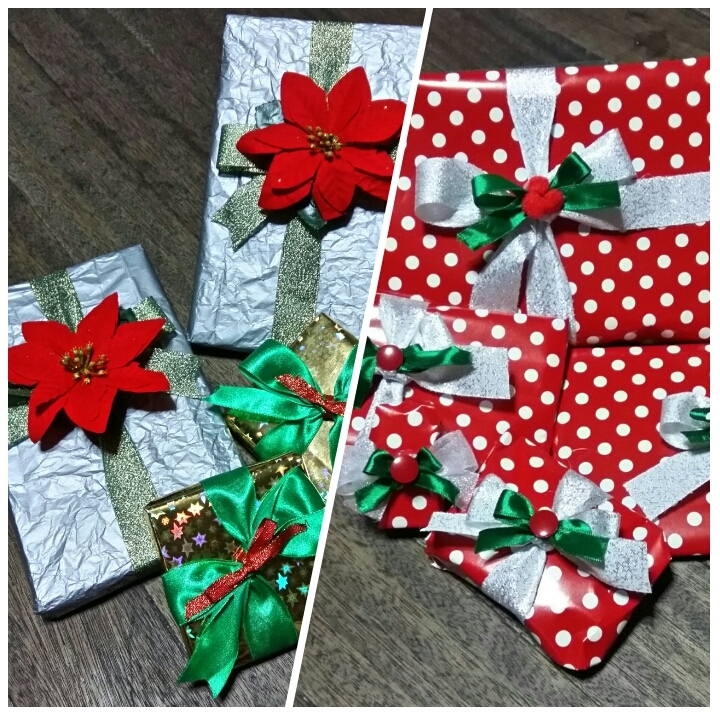 Back To Basics: Holiday Gifts 2015. Felt like ages since I last posted here, no? Oh wait, it actually was ages since I last posted here. Snark aside, I did miss doing these crafty sort of posts. 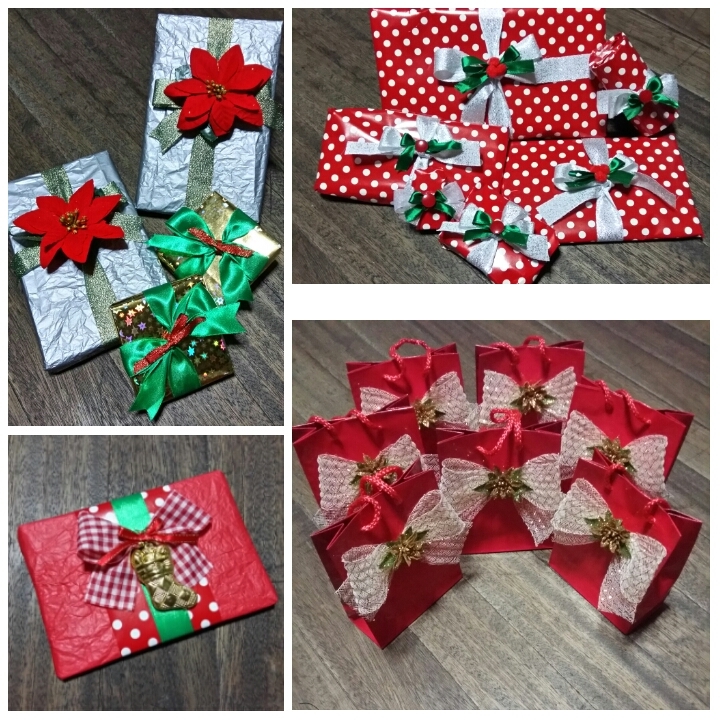 Hopefully I can do more than a couple for 2016! No reinventing the wheel this year, so to speak. 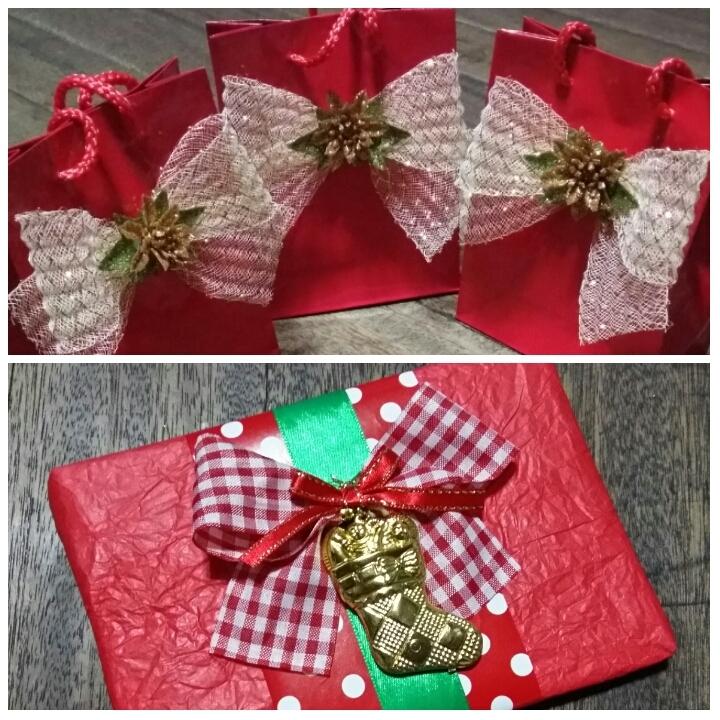 I chose to use the traditional Christmas colors of red, green, gold, silver and a dash of white. Seems like a LOT of colors, but when for some magical reason, they all work together really well. I included some embellishments and trinkets from my deep box of crafting doodads to add dimension and that touch of whimsy. 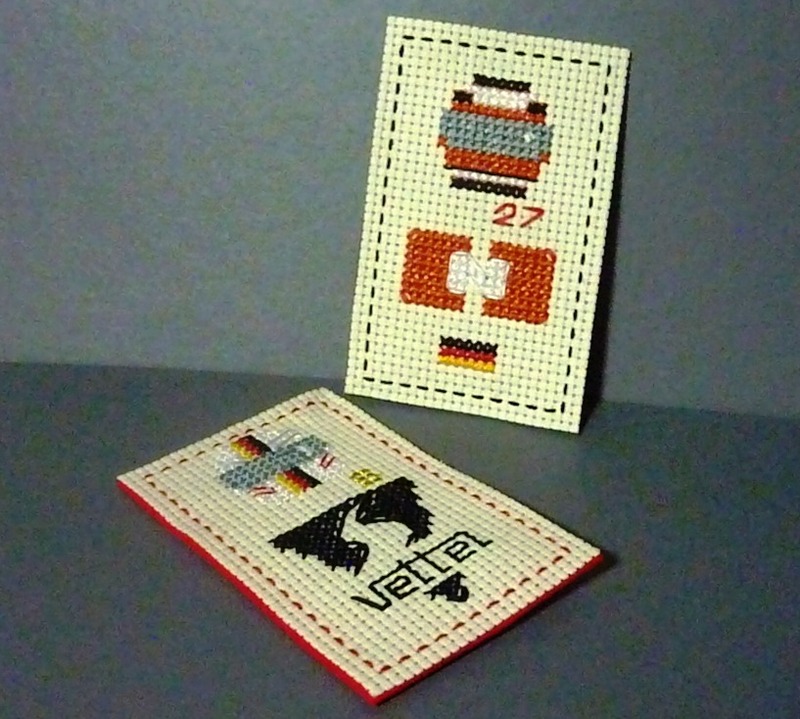 German Power: How To Make Your Own Sebastian Vettel and Nico Hulkenberg-Inspired Cross-Stitched Bookmark/ Pop Art/ Keychain/ Bagtag. 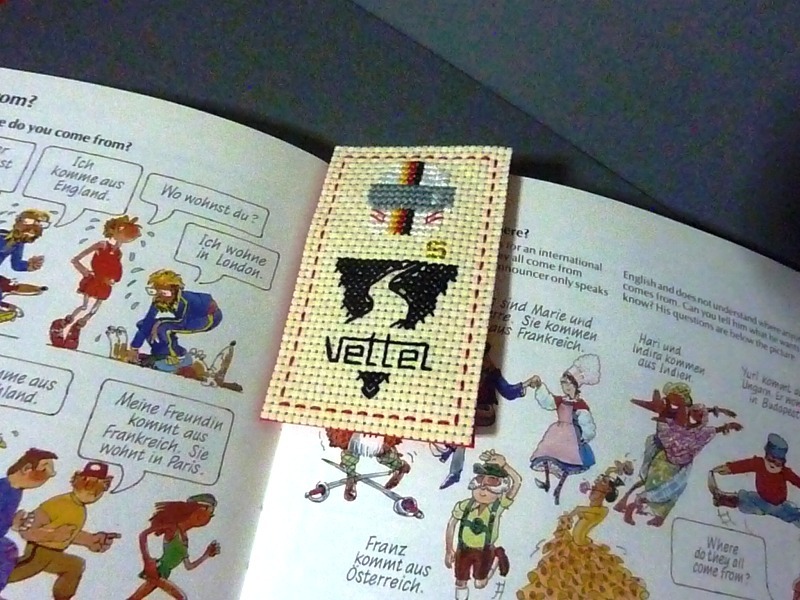 The Cross-Stitching Inner Grandma in me has returned and this time, with F1 on her mind. 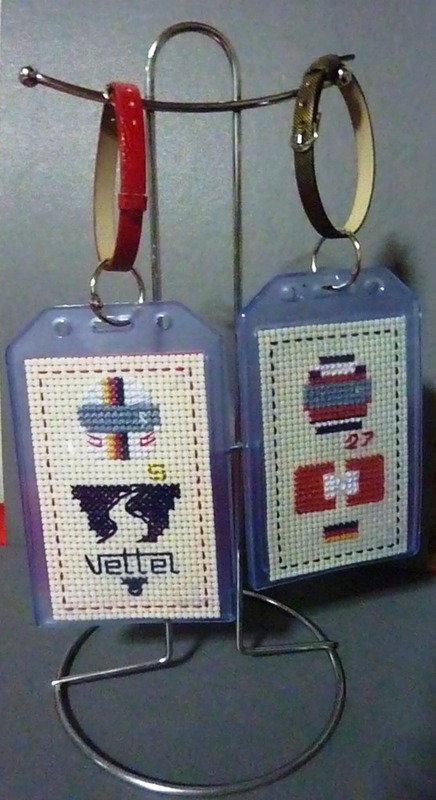 Sebastian Vettel (currently with Scuderia Ferrari) and Nico Hulkenberg (currently with Sahara Force India) are two of the German F1 drivers I like most after Michael Schumacher, and so I’ve decided to celebrate their general racing awesomeness by making a crafting project inspired by them. 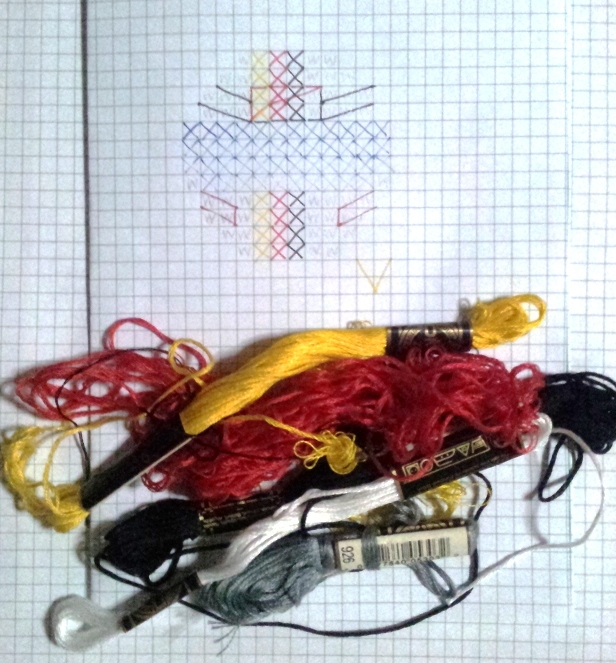 Materials: Cream-coloured cross-stitch cloth (leftover from my previous bagtag project); red, yellow, black, orange, gold, grey and light grey cross-stitch threads; cross-stitch needle; regular sewing needle; red and grey felt fabric; graphing paper; pencil; coloured pens; soft plastic ID cases; metal binder rings; belt-like bracelets. 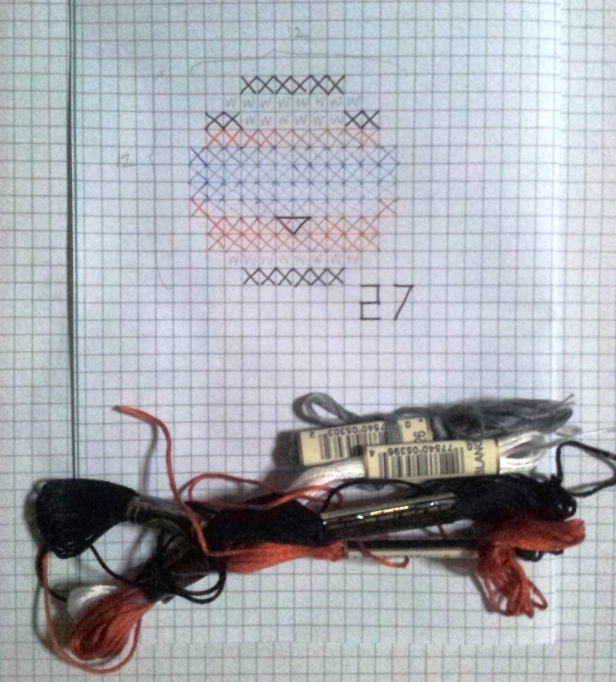 Before anything else, the geek in me insisted that I carefully make patterns in order to have a clear idea on what the designs will look like, so I unearthed graphing paper from the depths of my office supplies stash and grabbed a pencil and a few coloured pens and started drawing away. 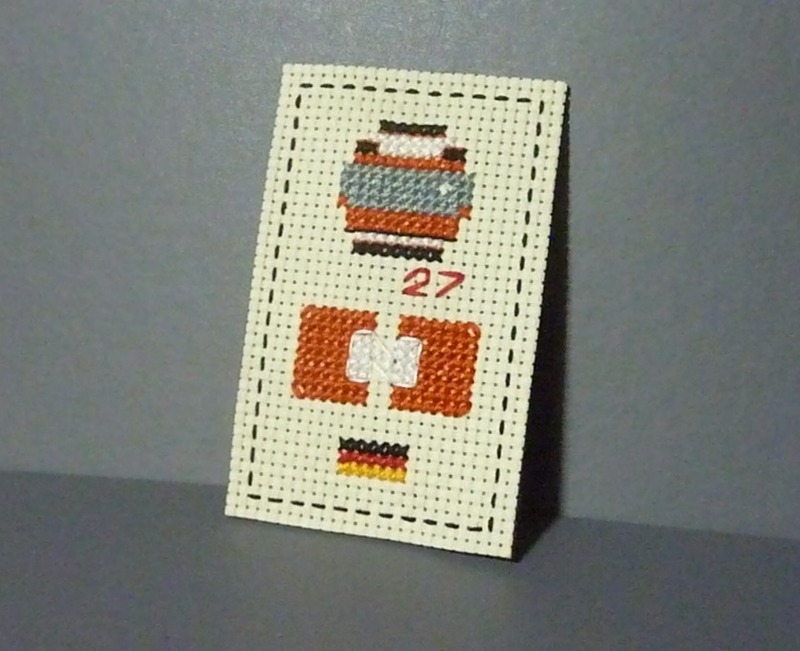 Pattern for the Hulkenberg Cross-Stitch. 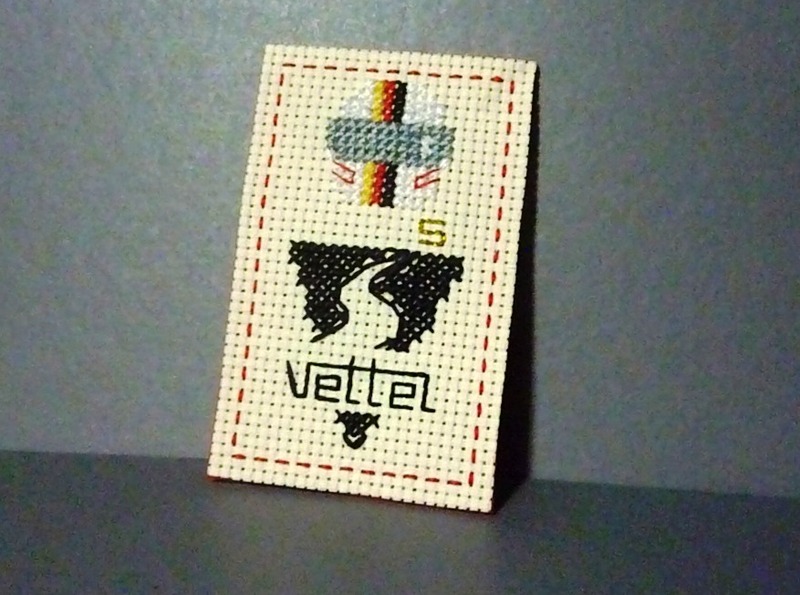 Pattern for the Vettel Cross-Stitch. 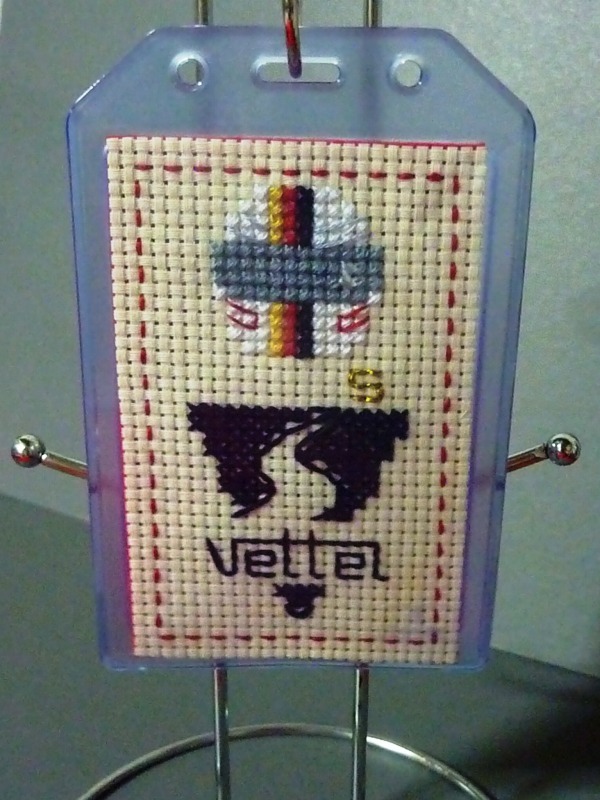 The helmet patterns (and Hulkenberg’s logo) were pretty easy to draw, what I had quite a difficulty drawing was Vettel’s logo. I had to use a bit of math know-how (hello, Geometry!) 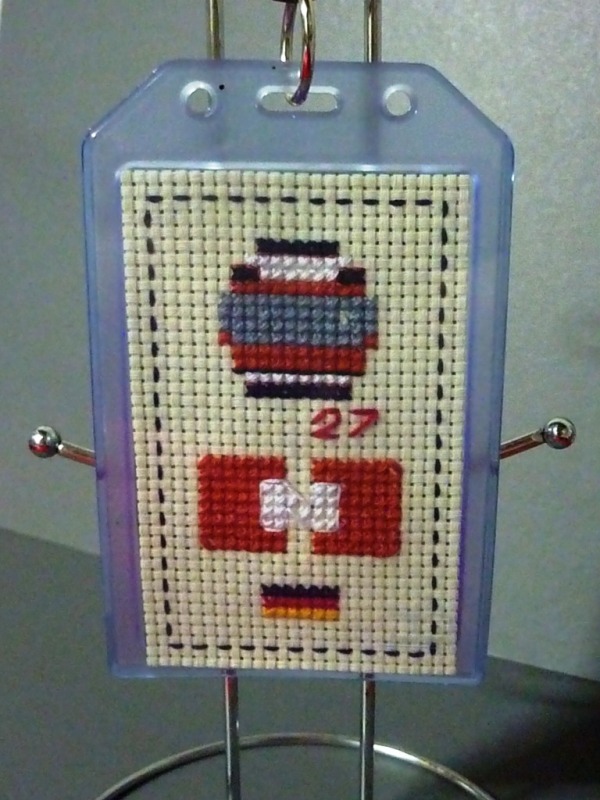 to figure out the best way to depict it via cross-stitch! 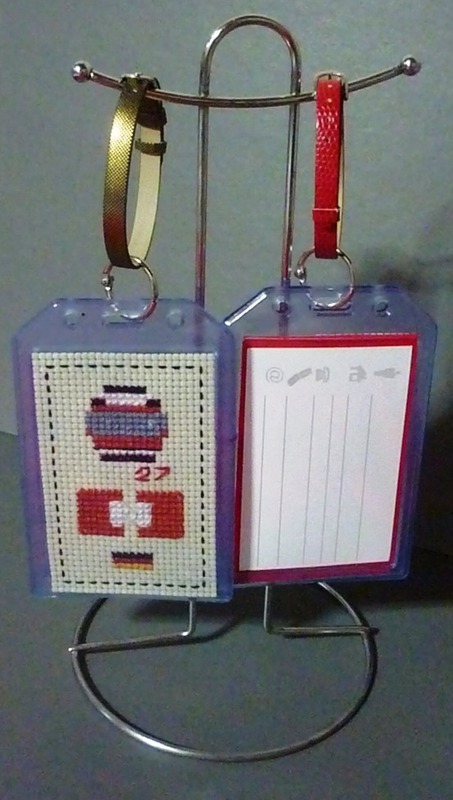 I still had some leftover cross-stitch cloths that I cut into 2.5 x 4.0 inches from my previous bagtag project, so I decided to use them for this project as well to keep the guesswork out of sizing. 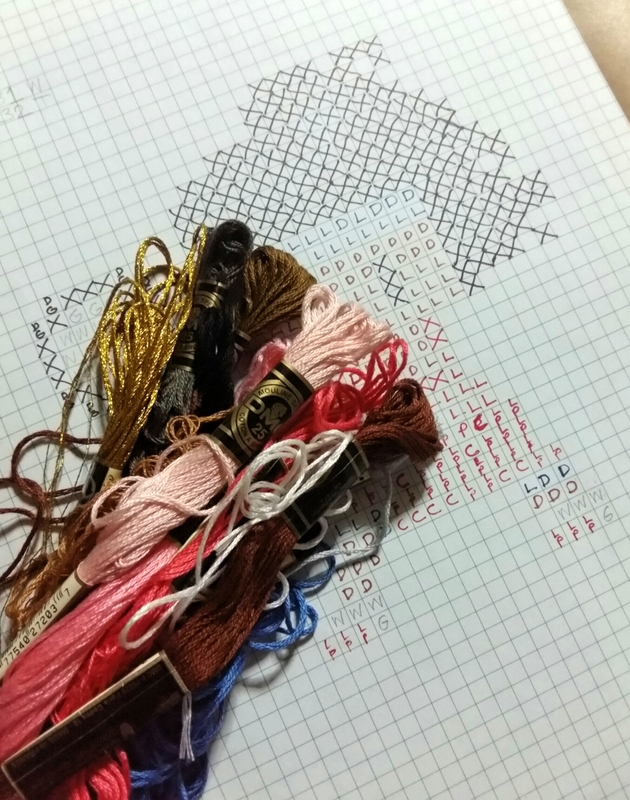 Time to stitch! 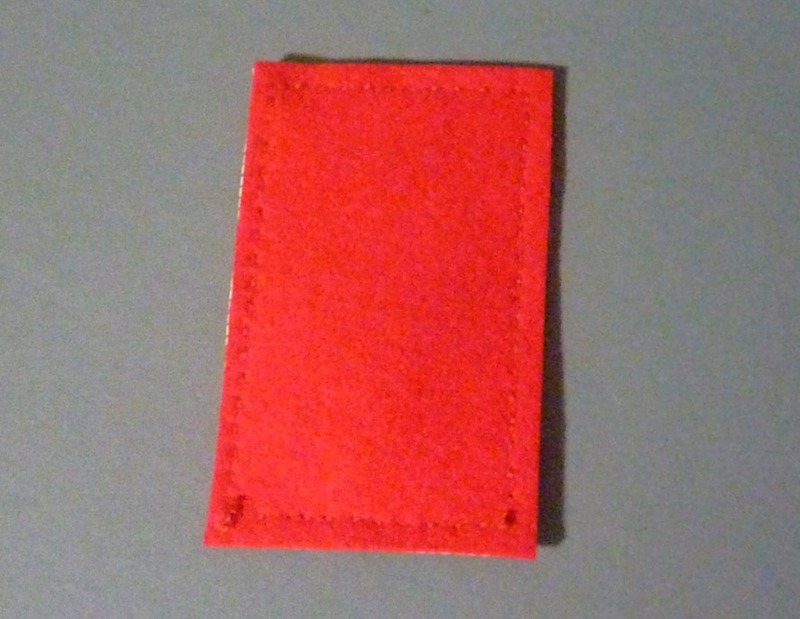 After finishing the helmets and the logos, I took the red and grey felt fabrics and secured them to the backs by doing a simple running stitch. 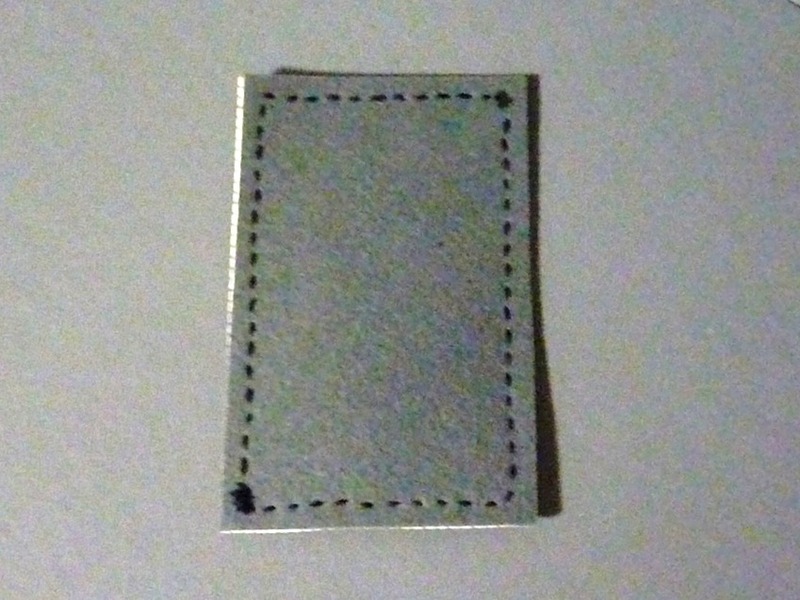 Make sure to switch to a regular sewing needle when working with the felt fabrics as the cross-stitch needle isn’t sharp enough to penetrate them. And here are the multi-purpose finished products! 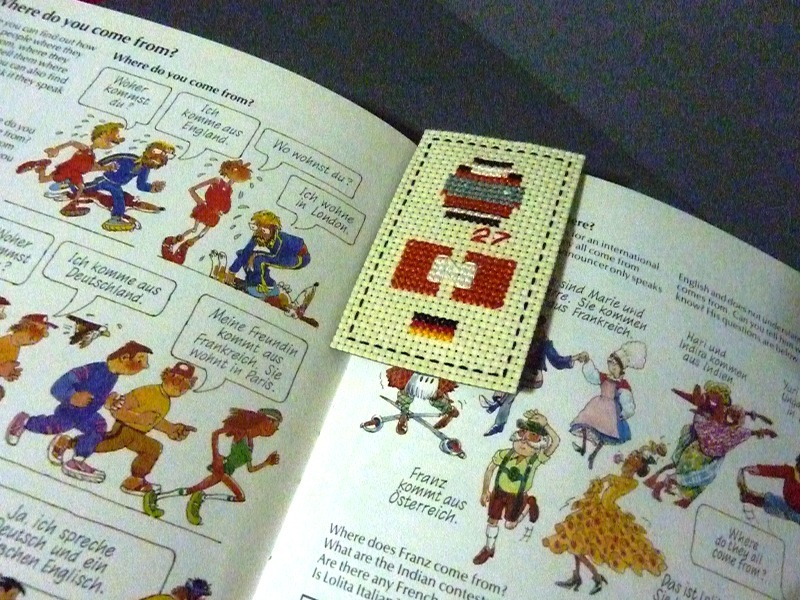 As Bookmarks: Use them as they are. 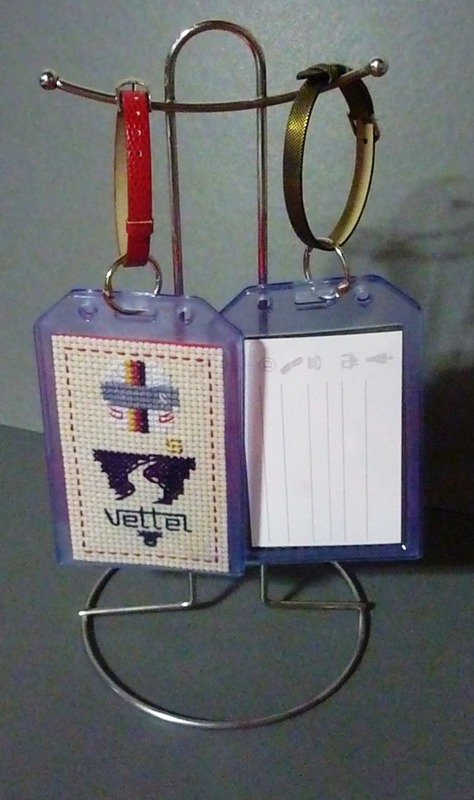 As Keychains: I simply bought soft plastic ID cases, placed the cross-stitch works inside, and then attached a metal binder ring and the black-and-gold/red belt-like bracelet. Alternatively, you can also use a ribbon of your choice, a thin rope or a metal carabiner. 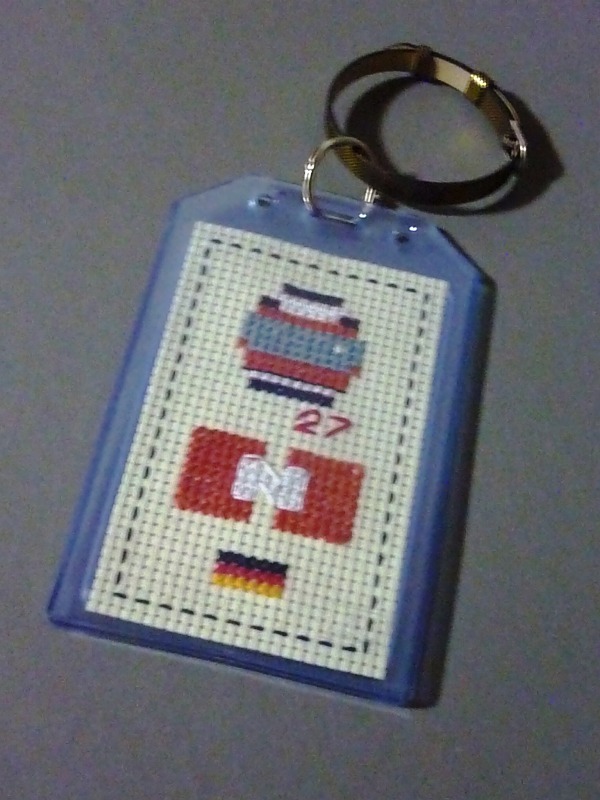 As Bag Tags: Same with the keychains, except I inserted a card at the back where you can write your personal details such as name, address, email, etc. 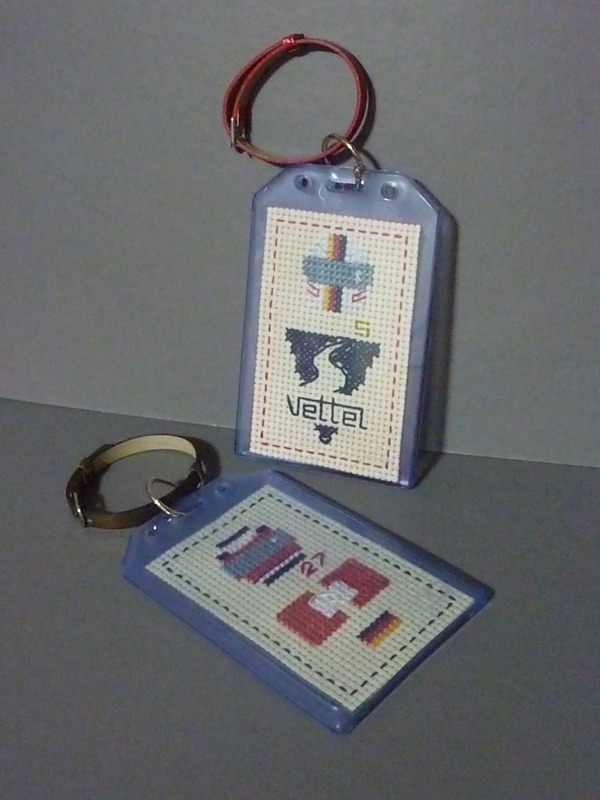 There you have it, four different uses out of two cross-stitch works. Mini in sizes but maxi in function!